The CSA box I got a couple weeks ago was—much like the rest of us here in Georgia—stuck between summer and winter. There were some delightful strawberries and spring-y butter lettuce, but a couple of sweet potatoes as well. I don’t give sweet potatoes much thought, generally, but the timing seemed perfect since I’d just pinned this recipe. I’ve been really trying to focus on cooking and eating healthy when I’m at home (minus a few Chinese food-palooza Satuday nights), particularly since I’ve had a rash of delicious but indulgent lunches and dinners for work. 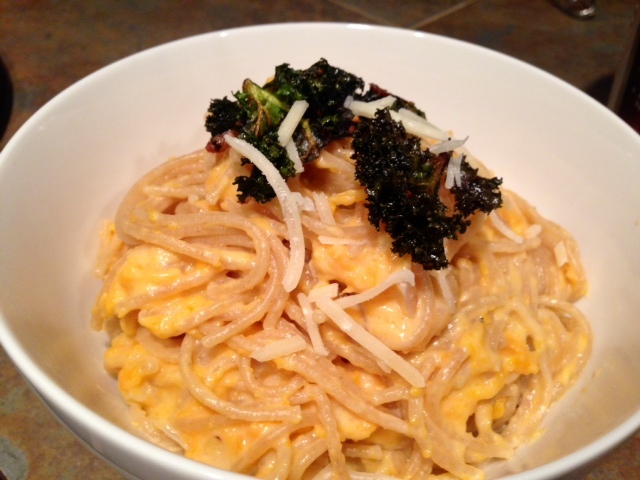 This recipe seemed to balance my need for comfort food that (especially chilly) day, but the presence of whole wheat pasta and adding creamy sweet potato to the sauce upped the healthy quotient. 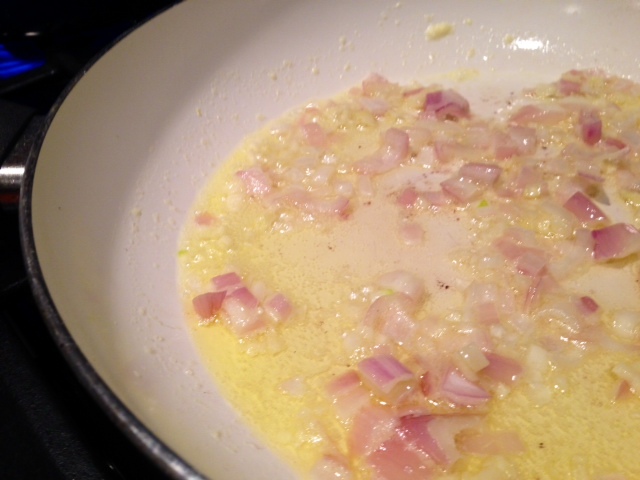 The sauce also has deeeelicious sauteed garlic and shallots to make a super flavorful base. I had a little trouble with the crispy kale (left it in the oven too long…yikes!) but overall this was simple and awesome and totally satisfying. Preheat oven to 350 F. Tear up the kale leaves and place in a large bowl, adding the sesame oil and half of the salt and pepper. Use your hands to toss everything together and make sure all the kale is coated, massaging for a minute or two. This distributes the flavors and tenderizes the kale. Spread on a lined baking sheet and bake for 13-15 minutes, until crispy. Remove and set aside. You can cook the sweet potato however you like, I just baked it in the microwave (7-10 minutes, make sure to stab it a bunch so it doesn’t explode). Then I squished it out of its skin, the skin won’t combine into the sauce well. Also, you may want to heat up the milk for the sauce in the microwave—you don’t want it boiling or scalded, just warmed up. This helps your bechamel come together well. Bring a big pot of water to a boil, add a big handful of salt, and cook the pasta according to directions; I prefer mine al dente, so minus a minute or two. 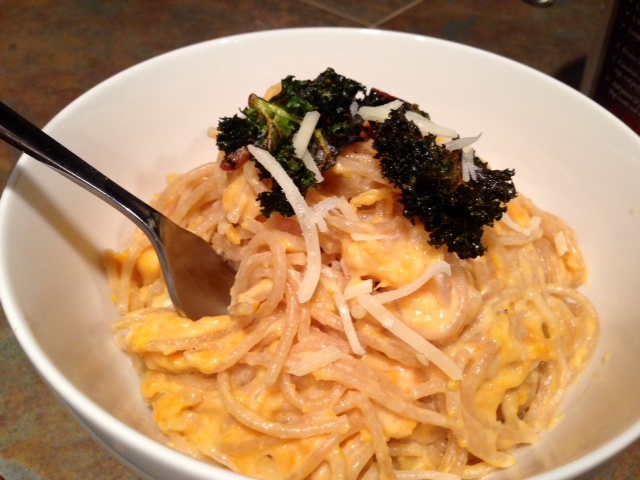 While the kale and pasta are cooking, heat the olive oil and butter over medium-low heat in a large skillet. It’s important the heat isn’t very high, or you’ll burn the garlic. 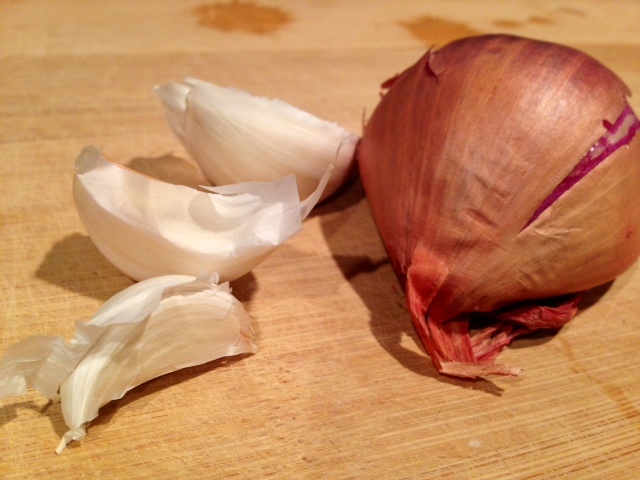 Add the shallots and garlic with a pinch of salt and cook for 3-4 minutes, until soft and translucent. Increase the heat to medium and add the flour, whisking quickly for about 30 seconds to create a roux. Once the roux has turned golden, begin adding in the warm milk a little at a time, whisking in between to fully incorporate before adding the next splash. Once all the milk is combined and the sauce has started to thicken a little, add in the mashed sweet potato and whisk it into the sauce fully. It’s okay if a few small bits of potato remain. Let the mixture come to a simmer in order for it to thicken a bit. Once it’s thickened, reduce the heat to low and stir in the cheese and remaining salt and pepper. 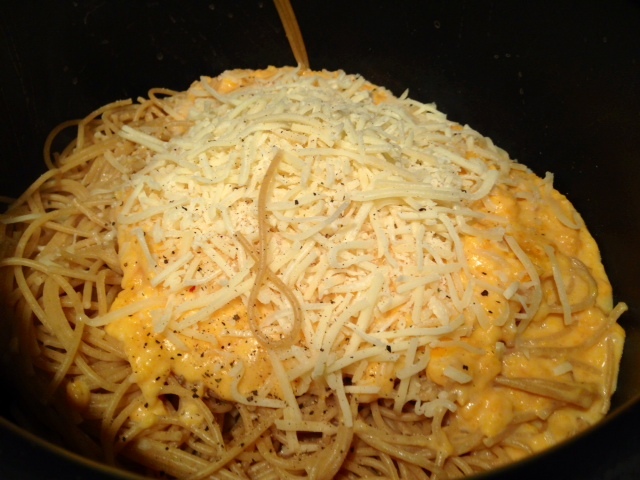 Drain the pasta and add the noodles directly to the sauce pan. My pan was too small, so I just poured the sauce into the pasta pot. Toss to get everything fully coated. 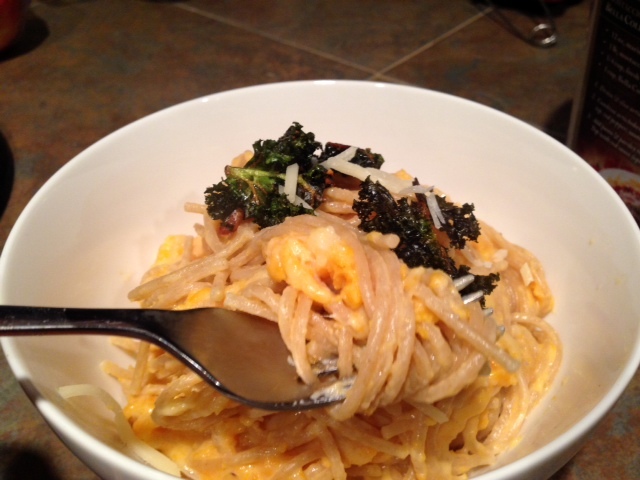 Transfer everything to a large bowl, sprinkle with a little cheese, and top with the crispy kale. Enjoy! Makes great leftovers too. 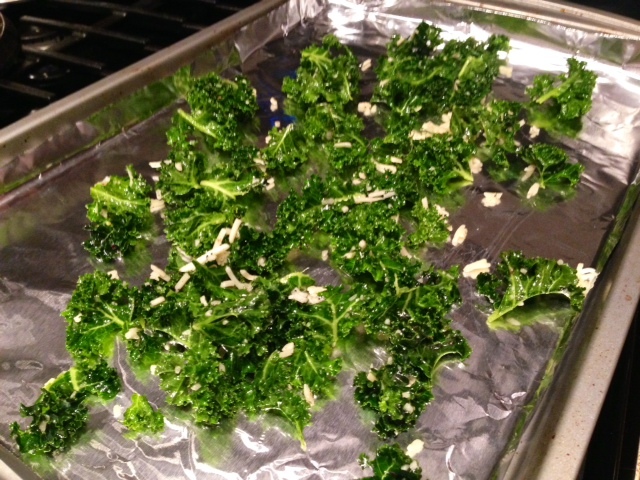 Preheat oven to 350 F. In a large bowl, add kale, sesame oil, 1/4 teaspoon salt, and 1/4 teaspoon pepper. 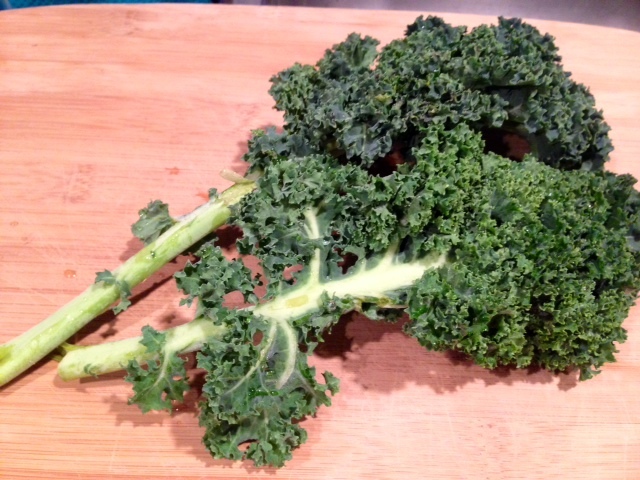 Using your hands, toss to coat and massage the kale for a minute or two. This distributes the flavors and tenderizes the kale. Spread on a lined baking sheet and bake for 13-15 minutes, tossing 1-2 times while cooking, until crispy. Remove and set aside. I also baked the sweet potato in the microwave and removed it from its skin. It helps to heat up the milk for the sauce in the microwave as well—you don’t want it boiling or scalded, just warmed up. Bring a big pot of water to a boil, add a big handful of salt, and cook the pasta according to directions; I prefer mine al dente, so minus a minute or two. While the kale is cooking, heat the olive oil and butter over medium-low heat (this is important, so you don’t burn the garlic) in a large skillet. 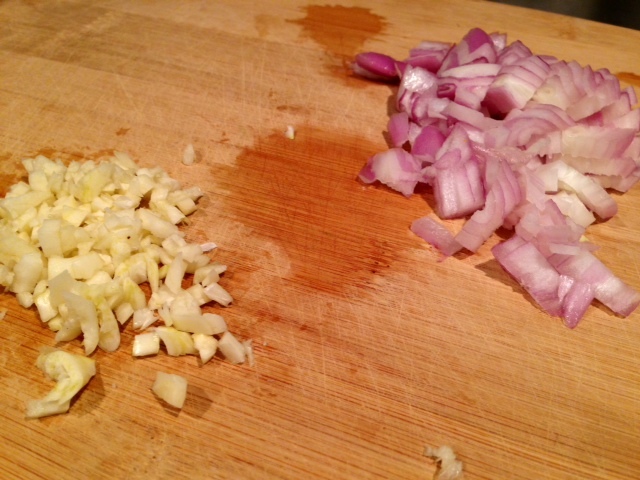 Add the shallots and garlic with a pinch of salt, and cook for 3-4 minutes, until soft and translucent. Increase the heat to medium and add in flour, whisking quickly for about 30 seconds to create a roux. Once the roux has turned golden, begin adding in the warm milk a little at a time, whisking in between to fully incorporate before adding the next splash. 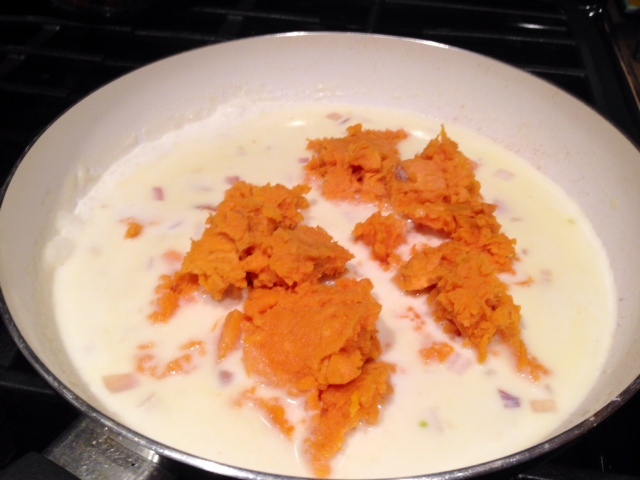 Once all the milk is combined and the sauce has started to thicken a little, add in the mashed sweet potato and whisk it into the sauce fully. It’s okay if a few small bits of potato remain. Let the mixture come to a simmer in order for it to thicken a bit. 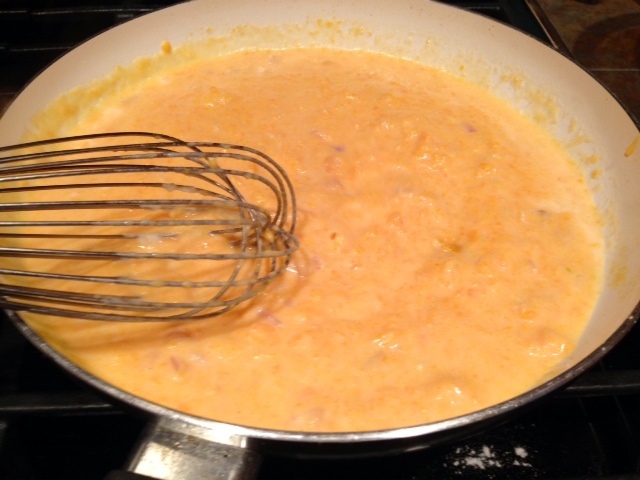 Once it’s thickened, reduce the heat to low and stir in the cheese and remaining salt and pepper. Drain the pasta and add the noodles directly to the sauce pan (or if your pan’s small, add the sauce to the pasta pan). Toss to get everything fully coated, then transfer to a large bowl, sprinkle with a little cheese, and top with the crispy kale.